As the home of some of Europe’s most exclusive beach clubs, it is no surprise that Ibiza is a popular destination for tourists. Live and breathe the island’s bohemian spirit at the bars below. For a classy start to your night, head to The Ninth. As if the full panoramic views of Playa d’En Bossa and Ses Salines National Park weren’t enough, you can also watch planes land in the nearby airport as you sip on your vintage champagne. The minimalist, monochrome decor of this chic sky lounge resembles that of a yacht. The strategic positioning atop the ninth floor of the Hard Rock Hotel gives the impression that you really are floating on cloud nine. If you’re a hippy at heart, the bar for you is Kumharas. This beachside hang-out provides unrivaled views of the spectacular Ibizan sunsets. Although it lies just a short distance from the throng of tourists in San Antonio, this mellow bar seems to exist in an entirely different dimension. The exotic decor featuring floor cushions and Asian prints, transports you to a magical, far-off land. Don’t worry if you think you might not fit in: there are stalls selling bohemian gear late into the night, plus the relaxed atmosphere weeds out any pretension. Lose yourself in the bohemian vibes in the chill-out terrace while trying out their range of shisha. Sheltered at the foot of the walls of Ibiza’s old town, Dalt Vila, La Bodega features traditional Ibicencan architecture. The impressive building is a converted storehouse and stable and the decoration preserves elements of local tradition while incorporating an eclectic mix of art and furniture from all over the world. Their delicious tapas menu is complemented with a well-priced wine list which is updated often, so it’s no wonder that this bar is always buzzing. Hidden Bar holds an enviable location, a short walk from the beautiful Cala Sant Vicent beach on the north coast of the island. World-class mixologist Chris Edwardes’ delicious cocktails are elaborated with a heavy dose of originality which is also visible in the quirky decor. A collection of old-fashioned lampshades hangs behind a cursing garden gnome, setting the tone for this alternative fairytale land. This family-run bar has entertainment covered: with giant chess and crazy golf in store, you’ll never want to leave. It is impossible to talk about the nightclub scene in Ibiza without a nod to the internationally renowned Pacha franchise. The group has channelled the extravagance of the island’s world-famous party scene into this cabaret lounge. The phrase ‘dinner and a show’ is taken to new extremes in Lio where even the servers burst into song. Book a table for dinner, then stay for the party until the early hours. With an extensive food menu, world-class DJs and live entertainment all night, you have all you need for an unforgettable night of luxury and spectacle. While Amante is primarily an award-winning restaurant, it’s worth sticking around for the after party. Its stunning rural setting on a cliff overlooking the Sol D’en Serra bay creates the sense of exclusivity that makes the beach club scene special. However, they also cater for a more chilled night with their summer open-air cinema. Settle down on a bean bag against the backdrop of the moonlit Mediterranean and gorge on unlimited popcorn and world-class wine while you watch a range of recent blockbusters and old classics. To be shaken out of your sleepy, sunny stupor, pay Sluiz a visit. This quirky Dutch concept store is an oasis for artsy types, selling everything from unconventional furniture to colorful clothing. Shop ’til you drop…into the loungers at their al fresco bar. Choose from a wide selection of your favorite cocktails or recharge your batteries with a fresh juice. Look out for news about events: this outlet hosts live music, wine festivals and a range of courses, including cookery and photography. A converted farmhouse provides the ideal setting for this renowned lounge. KM5combines traditional Ibicencan architecture with influences from other cultures: after sampling the delights of the sushi bar, you can chill in the custom-made Bedouin tent. 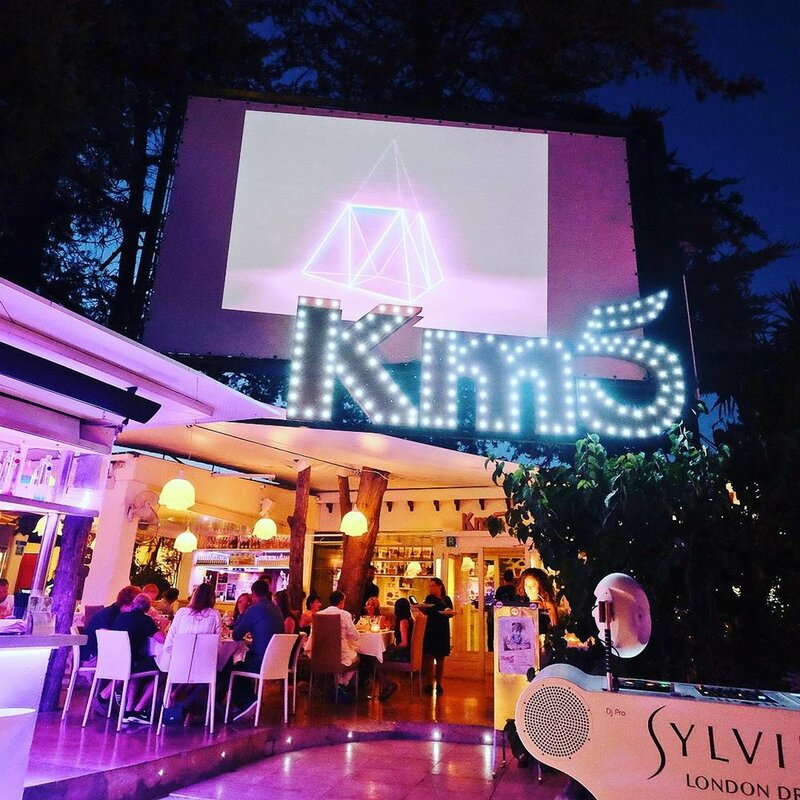 KM5 attracts a star-studded, cosmopolitan clientele thanks to its glamorous atmosphere. With a gourmet restaurant in which grilled meat is the protagonist and DJs on the decks until late, this venue will keep you going all night. Patrons with an interest in art and fashion should check out their gallery and boutique which promote both local and international artists and designers. For an authentic experience of Ibiza’s characteristic bohemian vibes, don’t miss S’Escalinata. The bar takes its name from its outdoor seating area. Bean bags are scattered up the stone staircase leading to the castle, making it the perfect location for a relaxing afternoon of people-watching. Time seems to slow down in this chilled-out ambience as you sip on a flavored mojito. The tapas menu should be enjoyed with one of their fresh fruit smoothies. Teatro Pereyra is all about the live music. Built in 1898, this building was the first theatre in Ibiza. Since then, this venue has been restored and converted into one of the most popular bars on the island. For those who like to dance but want an alternative to Ibiza’s electronic nightclub scene, Teatro Pereyra is the place to be. Their eclectic range of acts draws in revelers from all walks of life, striking the balance between tourists and locals perfectly.